There have been many advances in the field of corneal transplantation and development of eye banking over the last century has provided the supply of safe donor tissue and enabled to schedule surgery rather than react on an emergency basis. However, still, there are developing nations deprived of those advances. In India, there are 505 eye banks registered with eye bank association of India. As per Indian National Programme for control of blindness, the target cornea collection for the year 2010 was 60,000 and only 45,000 corneas could be collected. This backlog can only be cleared by making good eye banking services available along with improved collection of eyes and proper facilities for tissue procurement and improved storage. There are many reasons for poor collection of cadaveric eyes, but motivational donations of hospital-based death could really change this scenario. This study analyzed the 6 years records of eye bank on the patterns of age, gender, geographical distribution of eye donations, and impact of topography and climate, on the procurement of the eyes. As this city of Shimla is situated in Himalayan region at the longitude of 77°-0” and 78°-19” East and latitude 30°-45” and 31°-44” North, there is limited accessibility to eye bank services in difficult terrains particularly during the winter season. Hence, the collection of eyes is not possible even if it is available due to poor accessibility of remote areas in the absence of aerial services. This study retrospectively analyzed the data on eye donations at tertiary institute at IG medical college Shimla. The data were retrieved from year-wise records of the patients with effect from January 2011 to December 2016 from recipient register, donor register, donor pledge register, and safe disposal of human organ register available in the eye bank. The records from donor register were obtained included name, age, address, cause of death, whether donor was hospitalized or history of blood transfusion received, or patient had any neurological illness. The types of donation were noted whether it was motivational or voluntary. In motivational donation, the near relative of the deceased was motivated for consent to donate following deaths of the patient by the hospital staff particularly the nursing sister in intensive care units. The serological profile of the donor blood taken before enucleation for the screening of HIV, hepatitis, and syphilis was also noted. Slit lamp grading of donor's cornea in terms of epithelial haze, epithelial defects, stromal haze, and descemet's folds was noted. The quantitative evaluation of corneal endothelium was done using Konan specular microscope (model EKA-04 made in Japan). The 6-year record of eye bank was analyzed in terms of sociodemographic profile, communicable disease profile in donor, and types of eye donation for procurement. Out of total number of eye donations (n = 100) 48 were males and 52 were females. 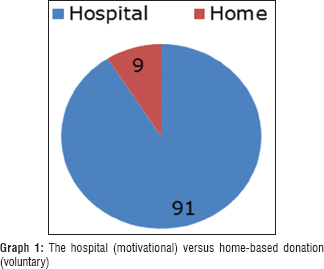 Urban and rural distribution of eye donation; home and hospital retrieval [Graph 1] 91 donations were retrieved from the hospital while 9 donations were home based. The hospital staff had a significant role in motivating eye donations as there were 91 motivational eye donations and 9 donations voluntary. 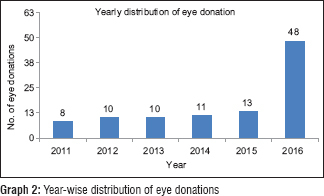 [Graph 2] showing maximum number of eye donations in the year 2016 (n = 48), followed by year 2015 (n = 13) and year 2014 (n = 11). 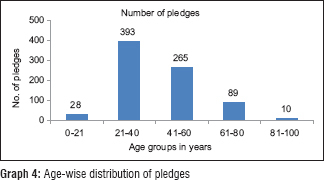 Age wise and yearly distribution of pledges is shown in [Graph 3] and [Graph 4]. Total number of patients registered in eye bank requiring keratoplasty is 150 and while number of deaths reported in this institute was 1500 in the year 2015. 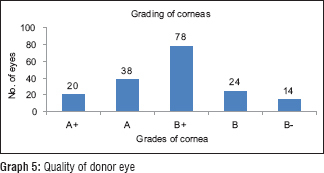 Quality grading of donor's eye shows maximum number of donated eyes were of B + Grade [Graph 5]. 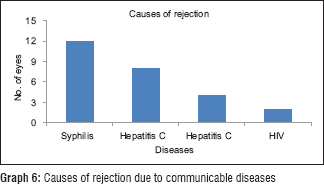 Causes of rejection of donated eyes were syphilis (n = 12), hepatitis C (n = 8), hepatitis B (n = 4), and HIV (n = 2) [Graph 6]. Utilization rate of eye donations was 174/200 × 100 = 87%. In our study, out of a total number of 100 donations, the number of female donors (n = 52) were slightly higher than males (n = 48). This is in contrast to study by Patel et al. in 2005 in which out of 1628 donors, 69.8% were males and 30.2% were females. This can be explained by the increasing involvement and participation of female staff members to spread awareness of eye donation and foster decision-making ability to donate eyes among females coming from the rural background. In this study, most of the donors belong to the age group of 60–80 years (n = 45), followed by the age group of 41–60 years (n = 29). Young donors <40 years constituted minority, i.e., 20–40 years (n = 12) and donors >80 years contributed to 14 eye donations. The mean age of the donors was 61.49 ± 17.1 years. This is almost similar to the study done by Patel et al. in which mean age was 59.4 ± 18.3 years. The majority of eye donations in the age group of 60–80 years can be justified by high mortality rate in this group. The less number of young donors can be explained by the reluctance of family members toward eye donation who are grieved by the death of a young person and are unreceptive of the concept of eye donation. In Andhra Pradesh, eye disease study, a study on awareness of eye donation in urban and rural population found that in the urban prevalence of awareness of eye donation was 73.5% and only 1.9% pledged eyes and in rural population prevalence of awareness was 30.7% whereas only 0.1% had pledged eyes. This less awareness was found in subjects >70 years, illiterate, females low socioeconomic status, Muslims and Christians., Similarly, in our study, there are less number of donations in >80 years which may be due to lack of awareness, diseased status of cornea and myths prevailing in this age group like fear of being born blind in next life or disfigurement of the face. In the year 2013–2014, a total of 45,969 corneas were collected through voluntary donation and 8286 through homeless crisis response programs. Hence, the hospital-based motivational donation constituted <20% of all donation. While in this study, a significant number of donations were procured through hospital corneal retrieval program (91%) and only 9% were through voluntary donation. This impresses on the efficient role of the hospital staff in motivating eye donations if the patients are satisfied with hospital treatment their attendants can be motivated for eye donation. Total number of patients registered in this eye bank requiring keratoplasty was 150, while the number of deaths reported in this institute was 1500 in 2015. So even if 10% of hospital-based deaths are converted to donation, it will be sufficient to clear this backlog. This also can overcome the hurdle of topography and climatic factors limiting the outdoor collection of cornea. A study by Tandon et al. to evaluate the response to request for eye donation from relatives of postmortem cases in tertiary care hospital in India found active counseling by the motivated team can be effective even in families with no prior knowledge of eye donation. In our study, 13 pairs (n = 26) of the precious cornea have to be rejected due to seropositivity. Studies have shown transmission of certain infectious diseases such as herpes simplex, zoster virus, Epstein–Barr virus, adenovirus, rubella virus, syphilis, hepatitis, HIV, and cytomegalovirus through cornea graft.,, Therefore, screening of donor's blood sample was done for HIV, hepatitis B virus, hepatitis C virus, syphilis, and the positive corneas were rejected. In our study, the utilization rate of the donor's eyes was 87%. Utilization rate is also determined by quality of donor's cornea. Most of the corneas retrieved were of B+ grade (n = 78; 39%) followed by A Grade (n = 38; 19%) and B grade (n = 24; 12%). This can be explained from the fact that majority of eyes were retrieved from higher age group (61–80 years; 45%). This higher rate of utilization in our study is due to the sole eye bank in this region which owns the responsibility of catering to corneal blind people in this region. According to cornea donor study investigator group, the procurement of corneas from older donors increases eye bank costs because corneas from older donors are less likely to be suitable for transplantation than corneas from younger donors. According to a study by Farias et al. corneal grafts from younger donors had significantly better evaluation than those of older donors and that the corneal graft preserved after 6 h of death had a greater tendency to lower cell count and to decrease in evaluation grades. The time elapsed since death to enucleation is called death enucleation time (DET). In our study, most of the donations were hospital based which saved the time required for procurement of eyes. This determined the promptness of eye bank services. However, the difficult terrains, hard weather makes it difficult to reach home-based destinations within 6 h. Despite less average DET in our study and efficient eye bank services, corneal grades were B+, as the higher age group (60–80 years) contributed to the majority of eye donations. A total of 785 people had pledged their eyes, out of which 50% belongs to the age group of 21–40 years followed by 34% in the age group of 41–60 years. On the one hand, we have younger population pledging their eyes; and on the other hand, we have high donating elderly age group. 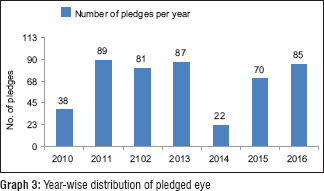 Although the number of pledges may not be converted to eye donations as this is unpredictable and it independent of the hospital-based motivational eye donation. The high literacy rates, awareness regarding eye donations have made younger population receptive of the information, education, and communication activities encouraging eye donation. We can plan and devise appropriate strategies by retrospectively analyzing the data from this study. In order to enhance the eye donations; the younger age group should be encouraged to pledge eyes, as this is the group that is more willing to provide their eyes and can contribute to high quality grade of cornea. Hospital corneal retrieval program can be the main source of eye donations which can not only increase the availability of cornea but can overcome the difficult topography and climatic conditions that limit the home-based retrieval of corneas. However, motivating the young population, dispelling the myths and beliefs in old and rural population, involving nongovernmental organizations and encouraging electronic media participation can go a long way in improving the eye donations. Doughman DJ, Rogers CC. Eye banking in the 21st century: How far have we come? Are we prepared for what's ahead? Int J Eye Bank 2012;1:1-15. World Health Organization. The Prevention of Blindness: Report of a WHO Study Group. (WHO Technical Report Series, No. 518). Geneva: World Health Organization; 1973. p. 10-11. Dandona L, Dandona R, John RK. Estimation of blindness in India from 2000 through 2020: Implications for the blindness control policy. Natl Med J India 2001;14:327-34. Patel HY, Brookes NH, Moffatt L, Sherwin T, Ormonde S, Clover GM, et al. The New Zealand National Eye Bank Study 1991-2003: A review of the source and management of corneal tissue. Cornea 2005;24:576-82. Goel S, Mazta S. Challenges to access of primary health care in hilly terrains of Himachal Pradesh, India. Internet J Healthc Adm 2006;5:1-3. Krishnaiah S, Kovai V, Nutheti R, Shamanna BR, Thomas R, Rao GN, et al. Awareness of eye donation in the rural population of India. Indian J Ophthalmol 2004;52:73-8. Tandan R. Controlling Corneal Blindness in India, Facts and Figures. NPCB India Newsletter; October-December, 2015. p. 3-5. Tandon R, Verma K, Vanathi M, Pandey RM, Vajpayee RB. Factors affecting eye donation from postmortem cases in a tertiary care hospital. Cornea 2004;23:597-601. Raber IM, Friedman HM. Hepatitis B surface antigen in corneal donors. Am J Ophthalmol 1987;104:255-8. Holland EJ, Bennett SR, Brannian R, Osborne JC, Goeken JA, Krachmer JH, et al. The risk of cytomegalovirus transmission by penetrating keratoplasty. Am J Ophthalmol 1988;105:357-60. O'Day DM. Diseases potentially transmitted through corneal transplantation. Ophthalmology 1989;96:1133-7. Cornea Donor Study Investigator Group; Gal RL, Dontchev M, Beck RW, Mannis MJ, Holland EJ, et al. The effect of donor age on corneal transplantation outcome results of the cornea donor study. Ophthalmology 2008;115:620-6.e6. Farias RJ, Kubokawa KM, Schirmer M, Sousa LB. Evaluation of corneal tissue by slit lamp and specular microscopy during the preservation period. Arq Bras Oftalmol 2007;70:79-83.